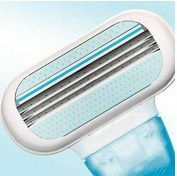 Gilette Venus Razor is the perfect versatile and easy to use razor for women. This Showersafe blade comes with refills which are each sealed separately to ensure that they remain clean and dry, even when stored near moisture. Don’t forget that Venus refill cartridges can be replaced with any Venus refillable system razors! This particular one comes with 1 razor and 1 cartridge. The three blades are engulfed in soft protective cushions that have a wonderful smoothening effect on the skin allowing a safe and close shave. 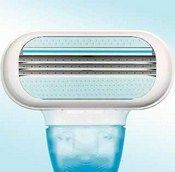 The pivoting rounded head is perfect to target hard to shave areas. What more, know when you are getting the best possible shave simply by keeping track of the indicator strip with Aloe and Vitamin E! The sleek handle is slip-proof with an improved grip, so go ahead and enjoy a nick free shave and the ultimate nourishment for your skin. See every little hair vanish, even bikini hair and experience the incomparable Venus smoothness! 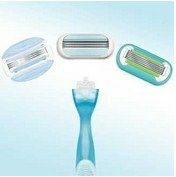 3 Blades : 3 blades for a smooth shave.The first 3-blade razor designed for women! 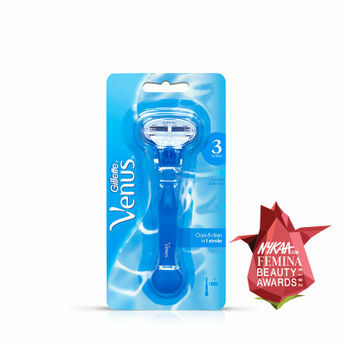 The Venus Original razor features protective cushions so you’re close and clean in 1 stroke. It’s a perfect match for freshly smooth skin. Protective Cushions : Protective cushions for a virtually nick-free shave.It gently smooth out skin for a close, and virtually nick-free, shave. Interchangeable Refills : Refill razor cartridges fit any Venus handle.Easy-to-change razor cartridges.